The 1986 Mustang GT have carry-overs from 1985 such as a hood stripe with GT lettering, GT embossed in the bodyside molding, rear spoiler, 10 spoke alloy wheels. The GT hood lettering and rear spoiler could be deleted. New to 1986 was a more fuel efficient 5.0L V8 high output V8 engine which put out 200hp, true dual exhaust with dual mufflers and catalytic converters, 8.8 inch Traction-Lok rear axle. Black 1986 Ford Mustang GT 5.0 with a 5.0 EFI High Output V8 engine, 15x7 inch wheels with original Goodyear uni-directional Gatorback tires, fog lamps, rear spoiler, charcoal hood stripe and "GT" embossed body side moldings. Check out these custom headlight inserts. Marc from CaliforniaSpecialEdition.com built them for his 1986 Mustang GT. He designs custom fiberglass and carbon-fiber components for a few selected automobiles. Scott Leise owns this charcoal 1986 Mustang GT coupe. It's our featured Attitude Of The Week for the week starting October 23, 2011. Scott tells us more, "This is my 4th Mustang. I have had 72 Sprint fastback, 91 GT, 99 GT, and now this 86 GT - 5.0L, T-Tops, and 5-speed. Its been completely restored - several mods including: headers, H-pipe, Pypes Violater after cat, camber-caster plates, FRP springs, Autometer gauges, 75MM TB & spacer, adjustable FPR, injectors, fender CAI, Hurst shifter, steering wheel, pony wheels & 245/50 tires, intake & valve covers painted body color, tail lights painted body color, and battery in hatch." Bright Red 1986 Mustang GT convertible with the largest engine offered in 1986, the 200 hp (at 4400 rpm), 302 cubic inch, 5.0 liter, electronic fuel injected, high output V8. Black 1986 Mustang GT hatchback owned by Heath Mckenna from Lynchburg, Virginia. Heath tells us more, "It has a 306 with Dss forged pistons, AFR 185cc heads, Eagle I beam rod, 410 gears, Moser axles, southside bars upper and lower control arms, subframe connectors, 6 point cage, Auburn Pro differential, aluminum driveshaft, C4 transmission, with 3500 tci converter, 650 Holley doublepump, and leather seats with T-Tops. My dream car I always wanted." Oxford White 1986 Mustang GT fastback owned by Kevin from New York. It has a 302ci V8 and a manual transmission. Kevin tells us about his GT, "I bought the car in 2006 with about 60,000 miles on it. The car was located in Whitestone Queens. The person I bought the car from had it 18 years. He purchased it from his friend who only had it for 2 years. That was the 20 year(at the time) history of the car. I only recently turned the odometer back to zero. It does not have six digits on the odometer. After 99,999 it goes back to zero. There is now 107,000 or so miles on it. It's still all original and runs great. The only modification is the lowering springs. I hate the way it rides and I'm putting it back to normal ride height." Black 1986 Mustang GT with a 200hp, 302 cubic inch (5.0 Liter) V8 engine. Dark Gray Metallic 1986 Mustang GT hatchback owned by Dwayne McCracken from Washington, Missouri. It has a 5.0L V8 engine and a manual transmission. Dwayne adds, "I bought this GT in 1990 when the car was 4 years old. It's 28 years old now and I'm still driving it. It's still stock except for the chrome wheels I put on it. It's runs as good as ever and I think it looks almost as good as it did when I bought it." Silver 1986 Mustang GT convertible with the largest 1986 Mustang engine offered: a 200hp (at 4400rpm), 302 cubic inch (5.0 liter), electronic fuel injected, high-output V8 engine. Bright Red 1986 Mustang GT convertible owned by Dan from New York. Dan says, "This is the last year of this body style before they went to the rounded composite headlamps and modular dash. It is also the first year of fuel injection for the Fox bodied Mustang GT. 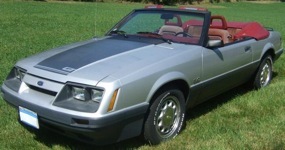 I bought this beautiful hard to find 1986 Mustang GT convertible around 9-10 years ago. I found it in Chicago for sale. I flew out one way and drove it home top down. This has been a fantastic car ever since. Here are some of the things that have been done to the car; brand new Jegs black powder coated water pump, lower radiator hose replaced, new Ford fuel filter, painted factory color and charcoal trim, replaced white interior, replaced dark red carpeting, replaced convertible top, replaced exhaust from the headers back, new Borg Warner 'World Class' T-5 manual transmission, short throw shifter, heavy duty clutch, alternator, battery, white glossy Cobra R 5-star rims, Hankook & Kumo wide profile tires, aftermarket stereo. $125 worth of manuals & books, and a heavy duty car cover"
Medium Canyon Red 1986 Mustang GT hatchback with T-top roof, rear window louvers, and a 210hp (at 4400rpm), 5.0 liter (302 cubic inch), electronic fuel injected, high output, V8 engine. Black 1986 Mustang GT hatchback owned by Larry Garlinger from St Clairsville, Ohio. Larry shares, "I have owned this vehicle since 1997. It is a 5.0 GT. It has the original motor, modified air induction, weld racing wheels, original paint. It has a little over 82,000 miles and has been garaged since its ownership by myself. I have won many trophies with this car and am very pleased with its performance and condition." This Bright Red 1986 Mustang GT hatchback has t-tops as well as the sportier wheels for 1986. I photographed this Mustang at the 2011 Mustang roundup held in Bellevue, Washington.